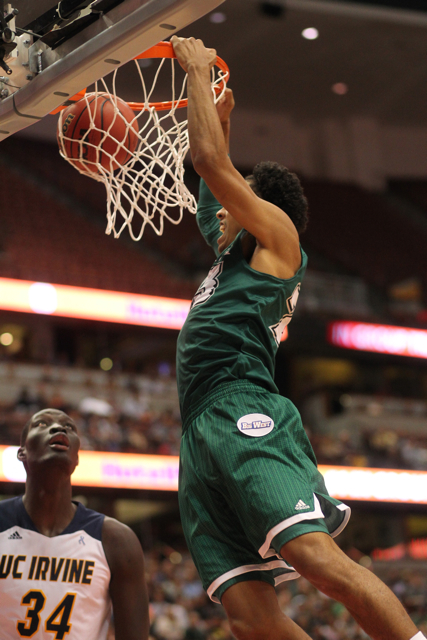 ANAHEIM, Calif. — A University of Hawai’i men’s basketball season characterized by many valiant efforts ended with one final one Saturday night, but it was not quite enough as UC Irvine held off the Rainbow Warriors, 67-58, for the Big West Conference Tournament Championship. A spirited crowd of 5,463 — including several hundred green-clad UH fans — at the cavernous Honda Center watched Luke Nelson score a team-high 17 points as the Anteaters overcame an early 13-point deficit to eventually take a slim lead midway through the second half and then hold off the Rainbow Warriors down the stretch. Alex Young and Will Davis II each added 10 points as UCI improved to 21-12 and earned the Big West’s automatic berth into next week’s NCAA Tournament, the school’s first-ever trip to the Big Dance. Aaron Valdes scored 17 points and Garrett Nevels added 14 points for Hawai’i, which ends its season at 22-13 – the most wins in a season for the program since the 2001-02 team. If Taylor and the 10 expected returnees (from those who suited up) do come back, it almost certainly will need to be next season. Taylor said he was told “back in November” that UH would not participate in so-called “pay-for-play” postseason tournaments such as the CollegeInsider.com Postseason Tournament (CIT). And the Rainbow Warriors’ 22-13 record and corresponding low Ratings Percentage Index position (153) is not good enough to warrant NCAA at-large or National Invitational Tournament consideration. “Right or wrong, we (UH) made a decision that we’re not gonna do it,” Taylor said of participating in the CIT. So it was “win or pau season” for the No. 5-seed Rainbow Warriors against the No. 3 seed Anteaters, and Hawai’i’s opportunity was there for the taking throughout most of the game. 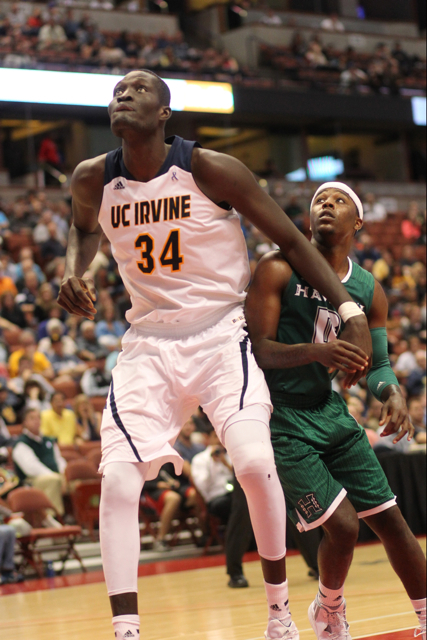 But after trailing from the outset, including a 13-point deficit early in the first half, UC Irvine eventually tied it at 35-35 on Davis’ hook shot with 15:11 remaining in the game and the Anteaters then took their first lead at 41-39 on a hook shot by 7-foot-2 reserve center Ioannis Dimakopoulos nine minutes into the second half. Isaac Fleming capped a 5-0 run for UH with a layup to help the Rainbow Warriors take the lead back at 45-43 with 8:26 left, but UCI regained it at 48-47 when Young banked in a runner from the right side with 6:21 remaining. 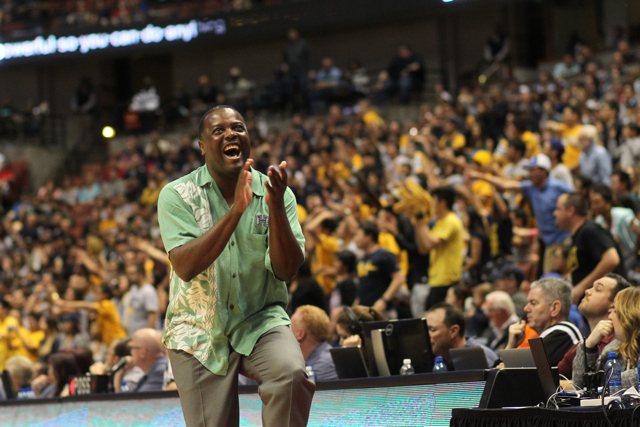 The Anteaters later stretched the lead to 59-52 after Nelson’s deep 3-pointer with 1:22 remaining, although Hawai’i was able to close it to 61-58 after Roderick Bobbitt’s three-point play with 45.9 seconds left. But Nelson and Aaron Wright made a combined six of eight free throws down the stretch to seal the victory. As it did the previous two days, Hawai’i started fast out of the gates, taking a 14-4 lead in the first five minutes after Nevels’ 3-pointer from the left wing and later extending it to 20-7 on Isaac Fleming’s 3-pointer from the right wing with 12:42 remaining in the half. Fleming got another 3-pointer to drop four minutes later to put the Rainbow Warriors up, 27-15, but Dimakopoulos answered with a 3-pointer from the top of the key to start the Anteaters on a 14-4 run capped by Young’s 3-pointer from the left wing that closed it to 31-29 with 1:03 before halftime. Valdes responded with a short jumper 30 seconds later to give UH a 33-29 lead at the break. Valdes had 14 points at halftime on 6 of 7 shooting — including both 3-point attempts — to go along with five rebounds. The Rainbow Warriors made 6 of 13 shots (46.2 percent) from beyond the arc in the first half and out-rebounded the taller Anteaters, 20-18. UCI, meanwhile, shot only 38.7 percent (12 of 31) in the first half but improved to 52.2 percent (12 of 23) in the second, meaning less opportunity for the Rainbow Warriors to grab defensive rebounds and get out on the break. And once they got into a halfcourt set, UH struggled to get effective penetration and convert close-range shots against the presence of 7-foot-6 center Mamadou Ndiaye — the tallest player in NCAA Division I. The Rainbow Warriors’ season run — an inspiring 22-victory journey that ended in the program’s first conference title game appearance since 2002 — is now over, but the memories created and respect earned will not soon be forgotten. Bobbitt and Valdes were named to the All-Tournament Team. UCI’s Davis was selected as the MVP of the tournament. I think Benjy and staff, and returnees, plus 4 good JC recruits, will be awesome next year.. they can win the regular season BWC .. and go for the BWC tournament title for NCAA’s, going to be very experienced team, with addition of two bigs.. that play defense, can score, run , rebound, dunk, quick, and play benjy ball.. plus two JC outstanding scorer shooters.. Just will add more pieces to a Great MBB program with , and if , Benjy is hired as new Head coach. Majority of all posts, even nationally say, Benjy Taylor deserves the job.. if national , pundits, and coaching fraternity, ESPN, CBS, and sports media types around USA say Benjy should be coach, with young team coming back..Then Benjy Taylor is the next head coach.. I believe he will.. common sense, and what he and team accomplished,.. incredible job !! UH MBB team, Garrett, Quincy, Jawato, Janks, Stef, NWC, Brocke, Zach, Mike, Dyrbe, Aaron, Rod, Isaac, Niko.. great season.. best wishes Garrett, and wait.. who knows if NIT or CIT.. if not. well have great pro career and come back to Hawaii as a coach too!! Any chance for N.I.T. ?? RPI is too low. Next year we should schedule higher RPI teams and we could then qualify if we finish high enough. First of all, I think The BENJY and the BOWZ, (someone needs to put that to music), deserve a huge Mahalo for the way they represented the 808 this year…a season that we will not soon forget. We will lose one valiant senior leader in Garrett Nevels and wish him the very best. The returning Bowz all have a lot to work on over the off season. With the knowledge that Irvine, who loses only one starter in Will Davis ll, will also have the advantage of having a full season of recruiting, unlike our Bowz! No doubt we will meet again next year to replay this game. As for the people in Bachman Hall, one can hear a huge sigh of relief to know that the SUCCESS of these BOWZ will not be in the daily news now reminding the UH ADMIN of their ineptitude. Who do you think you are kidding waiting to get a new AD to make the decision about a new coach? The new AD isn’t going to have the final say anyway!! Mahalo nui loa Dayton, Valerie and the supporters of this site for giving us all a reason to get up in the morning and professionalism that I don’t see from local media nor from any of our opponents. The team did everything they were supposed to do. They had the fire in their eyes and the hunger in their belly. Aaron had his sweet touch, Nevels was “soaring,” Bobbitt made the 100 steal milestone. The team was ready to go and all the boxes were checked to make it happen. Because of this, there is no regrets. There is no, if so and so was healthy, oh if we practiced more on those free throws, or that defense. The team was there to play and they played with full hearts. It hurts because they wanted it so bad. They are supposed to feel that hurt because then they know, they left it all on the court. The final run did not go in our favor, but what a ride it has been. In the midst of not knowing the future, all we can do is be in the present and be proud of the past. The coaches, staff and mostly the team stayed together. This season will be talked about forever and you guys made that happen. You made history. You showed everyone want brotherhood and loyalty looks like. You are our champs, you are our heros and the 808 loves and admires all of you. Thank you for the incredible journey. Thanks also to your families for supporting your decision to stay with us. Fly home safe. Love to you all. The presence of Mamadou in the paint really altered our style of play and was difficult to overcome. It almost seems “unfair” to have someone that tall playing against you and to think he is only a sophomore. The Bows put up a valiant effort but it would have required extraordinary three point shooting to win. Thanks to the coaching staff and the team, especially senior G Nevels, for a terrific season; one that surpassed my expectations at the beginning of the year, especially with the NCAA investigation hanging over their heads. The UH administration needs to do the right thing and give Benjy a multi year contract – he earned it and deserves it ! Dave Reardon excellent reasoning , He has become a major fan, and gives credit to Benjy Taylor too, why not? If boosters willing to put up the money? CIT or CBI participation, any post season play for this young team, the experience would be good. For UH to secure a home game or two, UH even brand new fans, of MBB and Benjy ball would go to SSC game to Aloha them one more time..I bet they would.. It is Not The Coach or The Athletes.. whomever making decisions at Admin/AD dept..saying they cannot afford $35,000.00 pay in fee for CBI or CIT.. If boosters or other donor could make it happen.. WHY I ask as long time, although disabled and cannot go to SSC, I would love to.. My heart is there every game home and away…Why Not Reward, so One more Home game at SSC, This edition 2014-15, The Team That Never said Die, The Coach who worked a miracle, brought together a Team this past October, that could have gone home.. and There would have been No Season, with UH having to pay back cancelled games..etc. That being the worst case scenario. No, for current AD , to say NO.. he reserving judgement on CBI or CIT participation.. if boosters or donor, willing to pay that 35K, fee, and 5000 tickets or more can be sold.. within few days.. and for This Team, I believe, the Tickets sold.. people online, or at the Hawaii Athletic outlet stores or SSC office would buy tickets, and several thousand fans.. would ALOHA this team so much. Even last year.. at 20 wins.. curious that UH did not , sponsor CIT/ CBI participation though they were worthy.. This Year’s Team EVEN more so.. that part, is the sadder story of the ending of season..If from December.. it was NIT or NCAA or Nothing.. That is a HUGE AMOUNT OF PRESSURE on interim coach and Team.. they almost went to the Dance.. I agree with boosters and donor, willing to upfront fee for CBI or CIT and with Dave Reardon.. Team is exciting.. they play with heart.. tremendous fight and will..very young team WHY NOT? Same thing with Hiring.. go through the protocol.. posting.. short list.. however Top of List.. Benjy Taylor.. He has guided team to BWC tournament championship game, won last 3 out of 4 games against BWC foes, Fullerton. and LBSU and Davis. top seed, to get to Irvine game.. And hire Benjy , so he and Senque can Recruit.. those JC bigs. and JC shooters.. Lot of exposure on ESPN and Fox Sports West Networks..that type of ball, They would want to play.. UH needs a Big and A shooter deluxe to complete the picture, for that 27 game winning team next season and BWC regular season championship team..
Go Bows. !! And Team and Benjy, the best season, hopefully not over.. eagle, remember we had this discussion last year.. priorities.. wbb over mbb.. This MBB team deserves it.. at least few more games, if people willing to buy tickets, and donors willing to pay entrance fee.. WHY NOT? Garrett said nobody expected them to be there and 22 wins for a great season. The only one i can remember was RunBows, who said in early November that they can win 22 or so games in the reg. season; he wasn’t too far off. Benjy is good at analyzing the games and has amazing recall of the plays and flow of the game, etc. Valdes says he’s excited for the future and the players are close as did Garrett say so too. The pictureoin today’s newspaper sports front page of Janks hugging Aaron says a lot. Anyone know who the next AD will be ? Can he make the right decisions for this basketball team and the other sports, including football ? Bad time to go cold in the second half and stress added to more bad passing and turnover. Team played hard, but the size inside caused us problems when shots didn’t go down from the outside and we tried to go inside and we were stopped down low. We needed have Jankovic to have a big game but it wasn’t to be. I thought Valdes and Nevels played great. We need to settle on the full time coach pronto because of recruiting. Taylor is the logical pick. There is no such thing as a permanent coach here. A permanent coach is someone like Coach K, Boeheim, Izzo, or even Gonzaga’s Mark Few. Hawaii is a stepping stone job. You either get fired if you lose or leave for another job if you do very well. Finally, thank you Gib Arnold for bringing in all the players that you recruited. Man, it’s just too bad that Isaac Fotu couldn’t play this season. If he did, we’d be dancing now. The Lack of support for Benjy and The Bows.. thru adversity.. and how They Brought a entire state, of new and older UH MBB fans together.. AD Ben Jay, thanks but no thanks.. even with ones willing to donate for CBI or CIT participation..Makes No sense… does the past 3 years with Ben Jay make any sense? Nope, just Nonsense and a big mess. If they will hurry up, so late already…and hire new AD.. Who has local ties.. and listens to, the 5-6000 rabid fans of Benjy Ball and the Bows. and more that view online media, or cable..Everyone I talk to, even some that don’t even follow UH athletics… they say MBB , and that guy Benjy, he doing great job.. hey..they winning yeah? I go yes , they winning.. makes the admin and outgoing AD look good, however, that Admin, the lack of support or, even.. this takes the cake.. they could have..when Benjy hit that 18 win mark.. did away with the national search for HC, and just negotiated with Benjy’s agent, and worked out a 2 year deal, guaranteed.. so he could lock in those possible, I am just guessing JC big and JC shooter. waiting in the wins.. sure.. he can still recruit out till August, however the sooner the better.. that Rebounder. talked about would be great. UH.. admin, from top to the bottom.. upper to lower.. same old same.. Now..Football spring ball, ? man.. with whomever put together that Murderous schedule.. you get the picture.. probably if Norm, and I like his assistants, he as a local boy, and his hard working team, bang out 6 wins, they finish at 6-7, would Power that be say, that is improvement.. and let Norm finish out his 5th year.. I bet they would.. However. Benjy, and MBB.. NCAA/ NIT or nothing.. in other words they don’t have money for pay to play, all that money going for legal settlements..? I give up. too old for this..
however Not Too Old to support Benjy and the Bows for coach..Rod B. said it well, he supports..Benjy for coach, did good job, however He not the one making decisions.. AD with local ties, or will listen to fans response.. and it is majority,.. that appreciate what Benjy Taylor and Bows have done. Yes, islandman, you have good memory, better than me.. I think I said.. UH with their schedule..could possibly go 22-10 before BWC tournament.. I did not realize the fallout, and later the injuries and illness, and just all that UH MBB and coach/ players had to endure. For myself fellow fans, for what it is worth.. in near 50 years of being fan of UH MBB and UH athletics, and alumnus, This Year’s 2014-15, MBB team.. what they have done, with Benjy Taylor at the helm. will be pointed to, as What Can Be done, when right person guiding a program, get everybody on board..coddle, encourage, let them play, work out things.. not perfect.. move on.. and team just won.. If NOT for those injuries.. UH would definitely have won 13-14 games in BWC season play.. and if just hit those open shots in first 6 minutes of second half.. well .. who knows..
We MBB faithful FANS.. to ME and thousands.. a special season. Aloha to Ben Jay.. I don’t know who next AD is going to be, he should have been hired in January, and locked in Benjy before the BWC tournament as HC.. for recruiting purposes and for benefit of program moving forward.. if AD goes outside.. I don’t understand…. Rainbow Warriors.. All 14 of you guys and Coaching staff. Awesome job..
Dayton, Valerie Schmidt, Schmidt Ohana, Ameriprise, Pacific Risk Solutions.. Thankyou for support and best Warrior Men Basketball forum and coverage on the planet. Hope, we hear soon who new AD, so he can hire Benjy Taylor soon before, maybe they go to a summer Basketball tour..? we shall see..
Aloha fans..it has been a great year. BEST I have seen , riding out storm through adversity !! RunBows signing off.. until.. new AD and Benjy is hired !! Hey to the 14 young men in MBB program make sure, absolutely sure, no matter what you decide after this spring.. Do well , super well this Spring UH Manoa school session.. maintain that high GPA, .. 2.7 not bad. maybe a little better.. Keep the APR strong..
School very important, for the families helping preferred athletes, thank you so much, and hope your sons appreciate it, which they do.. for the scholarship athletes.. very expensive paid education.. Brandon Jawato and Garrett Nevels.. Great job on time to grad this May ! Next up? Aaron Valdes, Mike Thomas.. great work, keeping academics going.and UH tutors, and professors.. and UH MBB staff, make sure team is on top of it academically.. if not. their is big dropoff.. would be sad..
however.. great young men.. even current AD, said you all and the Wahine, of all sports, represent 808 very well. Of Course Rod Bobbitt and Quincy Smith will be Seniors !! Next season, so 2 very important Cali , basketball and student athletes.. you two, just pedal to the metal.. incredible.. your effort even made Janks and Stef move faster, and dive for loose balls too !! Just Love the Whole Team.. that is Better than King of the Beach. Remember. we were all saying , or at least some that know.. if UH had 12 Brandon Spearmans.. Warrrior, Tip of the Spear, all out effort, every minute in game, and cheering on team from sidelines ? Well This year.. the 12 active guys when healthy, and in ball games. did actually that 12 Warriors.. bought into Benjy Ball and almost made the Big Dance.. If upper and AD/Athletics and Football in good stead.. or politics swing in favor of MBB program, doing well past two years.. Bows would still be playing, CBI or CIT.. UCSB think they are in CBI or CIT.. Source SA online poll March 14 2015: Should Benjy Taylor be made permanent(not interim)Head coach for Men’s Basketball? I thought you were signing off? Then 3 more posts. As u say , sheesh, bug already. See u next year but with different name. Will wait on your crystal ball predictions. I am sure Jeff P, Jackson W and Captain Bley’s fingers are sore from voting 196 times! 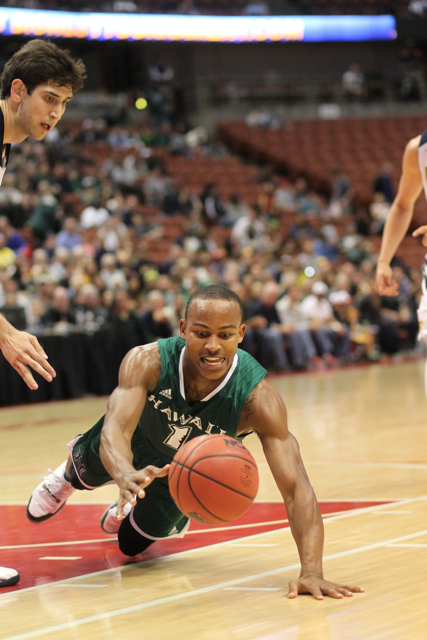 Wonder IF The Lousville — Big West Matchup Originally had Hawai’i In Mind? Me thinks it would be much better for UH and the Big West to have Irvine win as many as possible as it means more mullah for us all. veteran irvine team..uh mbb defend well..
hey..no too many of 351 ncaa div 1 mbb teams in nation have 22 wins. Benjy has excellent resume and support of majority of fans..
admin should appreciate what benjy accomplished!! It’s too bad that this team can’t play in post season tournament. They truly earned it. Wonder why no major sponsor has not stepped forward to offer paying for CIT invitation. Or do you need to get something in return like advertising? I think that a major sponsor stepping up now to pay the tab would show the true aloha spirit. What’s more there could be a donation site for the public to help with the costs. Hope someone does something to show appreciation for this team. I still remember rick pitino all of 23 or 24 years of age was freshman U. Mass. Team featuring junior Julius Erving..
and ones well and infirmed..
uhadmin power that be..listen..even Dave R,.. says benjy did good job!! servante. Sad…it appears to be agenda…without a doubt..very sure tax break..and just public notice for corporation. Men’s NIT brackets are set…Davis plays at Stanford first round. maybe another letter from AV’s wonderful mom? If major sponsors, politicians , students, man and woman on the street shout Benjy, Benjy, Benjy…!! I am pulling for you papa bear benjy!! Uhadmin get it done..something right for first time in years!! Not to rush to judgement I would ask some important questions for the long term success of the basketball team and the future when considering Taylor as the full-time basketball head coach at UH. There is no question that he and his staff did a very fine job this year in spite of all the turmoil, changes in coach(es), turnover in personnel (Fotu and Reyes) and the cloud of the NCAA investigation. Going forward we must inquire the following. 1) Who is Taylor and his staff are recruiting and targeting now. Who are the prospects? You can’t say in public, but the selection committee or AD can surely ask in private. 2) Who has Taylor recruited for Hawaii so far? I understand he recruited Fleming, I could be wrong. Akana recruited Fotu, Arnold recruited all the others, including Valdes, Bobbitt, Webster-Chan, Jankovic, Nevels, Standhardinger, Javonovic, Thomas, etc. etc etc. 3) What was Taylor’s record as a Head Coach at other places and who did he recruit as those places? 4) What was the team’s graduation rate when Taylor was the Head Coach at other places. 5) What is Taylor’s philosophy on offense and defense. I see a team right now with lots of intensity, quickness, but they tend to commit a lot of fouls and I don’t see the them running a lot of set plays. They seem to go helter skelter and they have periods of minutes that they can’t score. They make some bad decisions at critical times and they could have won at least 5 or 6 games if they played smarter. When it comes down to it, it’s the coach’s responsibility. I believe the administration/chancellor is wise to look for the best long term Head Coach for the University and interested coaches to apply, including Coach Taylor. There are a lot of good coaches out there believe me. If somebody has a pipeline to Australia, New Zealand, Europe, or the JCs, or California or whatever else, and is a good talent evaluator that’s a big plus. Hawaii is an attractive job. There should be no shortage of good coaches applying. May be best man get the job. In this what have you done for me lately world of coaching…I would also understand this. Right now we have a group of young ball players with talent that took 5 years in the making. Their first year and it was anything but easy, they won more games than any UH team I can remember. By bringing in a new coach, who’s to say how many of these kids will go and who will stay. We have a 5 year building block of not just JUCO’s but of frosh and sophomore elites. All they need is to get another year or two of playing together and they will be even more special than this year. I would hate to see what happened to the UH football team after playing in the Sugar Bowl and losing all that momentum we had with recruits due to UH ADMIN. Furthermore, if it is not Benjy, these kids “might” get a pass to have to sit out if they transfer. Another thing to consider is that the average Coach that gets his team into the NCAA Tournament makes over $1.4M per year. Our UH ADMIN is trying to buy someone for under $200K!!! In my world, you get what your pay for. Just by getting a new coach who is willing to start from scratch, does not give you any guarantees on whether or not this program will thrive. We have a sure thing right now for the next two years…why chance it? If Benjy blows it, then we go hunting. I am watching the Coaching Landscape right now and the turnaround time for replacement is weeks not months…athletic departments on the mainland know the value of RECRUITING! As for the T’s, I feel that was Gib’s fault by example. Benjy finally curbed that problem over the end of the season and I doubt it will be a problem anymore…our kids have matured. This year’s bench received ZERO T’s. As for grades, we will find out soon enough. As for the number of recruits we have available at this time it is 5…which means even if they take one or two away from us, can you imagine what three good recruits to add to this base would do? I am totally behind BENJY and the BOWZ. did mention, shooter and rebounding big awhile back…you are right..even bring in new coach..scramble and gamble recruiting like nash and gib had to do late hires..
For continuity…that is why admin /power that be/AD like stan sheriff..even donovan with athletic collegiate background , especially knowing hawaii situation in mid pacific..you are not going to get many top 30 athletes however still many good ones..
Basically uhadmin..why spoil a good thing..and possibly great team 2..3 years down road? Hire Benjy akamai…no calapari, coach K, Larry Brown, john wooden, rick pitino would come here..
like , how let june go.. While on the surface it seems like a no brainer to give Benjy the job there is a lot going on with the team under the surface that many people are not privy too. The weed smoking incident in the room, reports of fights between team members and players with academic problems are some of the things I am hearing from the admin. These guys played hard on the court and it was a fun product but many in the admin are not happy about how the team is being run off the court.